Pre-season is underway in the BAFA National League for all teams. With only four weeks to go to the season, most teams are now on a countdown to the first game of the season, pre-season games, camps, all of those are soon for the vast majority of teams. To speak a little about my own experience, I have a unique view in that my work sees me away from home Monday through to Friday. I am lucky therefore, in that when I go to the gym for 2 hours every night to stop me binge watching shows on popular streaming sites, I have time to listen to podcasts in order to keep up with the world of football whilst I do some cardio. This week, the Ex’s and O’s Podcast (can be streamed on spotify and itunes) discussed their most memorable moments from a career in the National League. They gave two examples that stuck out in my mind. The first, was when playing Bristol Apache, the end of the game (I’m paraphrasing) descended into a brawl, following some poor remarks by some members of the Bristol Apache sideline. The second, was the death of a player from the Maidstone Pumas. This made me pause for a moment to consider something. When I play a game for fun, no matter what, I may well have a competitive spirit, but win or lose, it takes an incredible turn of events to introduce any sort of major emotional event. So, with that in mind, I wanted to ask myself the question, can you ever play football for fun? It’s a Monday night game between the Bengals and the Steelers. 2nd and 5, the ball is on the Steelers 20, Dalton is in the pistol, he has a rookie, number 80 Josh Malone, out to his right. Malone runs a shallow crossing route over the middle for a gain of 3. The tackle is made by the leader of the defense, number 50, Ryan Shazier. It will be Shazier’s last ever play in the NFL. The play lasted less than 5 seconds. Watching the replay, the commentator noted immediately ‘He went in with his head down, that’s never a good thing’. This season when I coached at De Montfort University, we began the season by having every player practice tackling technique, using the USA Football/Seattle Seahawks instructional video. This hopefully reduces the chances of players making a fundamental error when tackling, and thus should prevent any players from suffering a life altering injury. 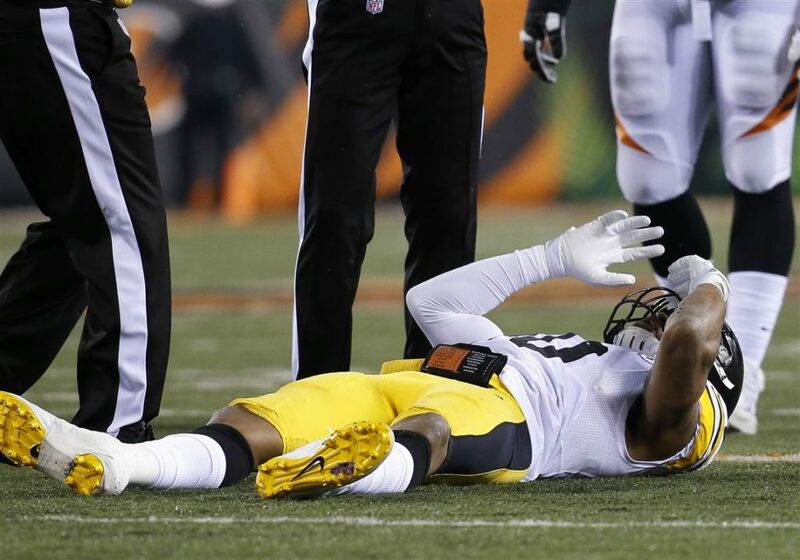 Image from the Pittsburgh Post Gazette, Ryan Shazier’s Injury was tough to watch for players across the NFL. Building on this, I recently watched Silas Nacita’s youtube video ‘The Rise of Guelfi’. Before the import players were allowed near the field, they were all tested by a doctor. This relates directly to some of our most tragic events within Britball. Deaths though rare, have occurred within our community. This seems oddly morbid, but here’s a reality that may well be overlooked. Do we ignore player safety ever to accommodate their aspirations? It’s a difficult question. Let me pose a scenario, a player joins the team, he is not in particularly good shape, but he pays his BAFA fee and then his subs in full. Ask yourself how many teams would ever say to players, ‘Ensure you’ve been for a physical with your doctor before our first pre-season game.’ With that in mind, is there a team in the UK that would turn a player away who puts themselves at an increased risk when they play the sport. I’m not talking about the freak accidents, I’m talking about a player stepping onto the field, in pads and helmet, who failed to hydrate properly, when it’s 28 degrees and there is no shade available on the side line. Do we as a community have a duty of care to other players to ensure they are in a proper state to play our sport? Bringing it back round to my point about Ryan Shazier, do we have to have honest conversations with players whose techniques prohibit them from stepping on the field? Is there a line to be drawn here? This oddly enough relates also to whether this game can ever be played for fun. The time a player must invest to be fit, to be coached properly on technique involves not only being coachable, but also having an attitude that sees them work for more than 2 days a week. When I say coachable, I don’t mean that when a player attends training, they have a passable attitude towards coaching. Coachable means they are available to be coached at every opportunity. Though fairly hypocritical of myself, given that when I work away, I’m not available for midweek practice, I believe that it would take a particularly good reason for me to fail to attend a training session. This in turn means cutting other parts of my life short for football. When someone asks why I play American Football, I explain that it is because I enjoy it or I have a passion for the game. Fun and enjoyment are not synonymous here. In fact, my enjoyment comes from when teams I am part of win. I don’t enjoy any aspect of losing. To be in the position where I can help my team win, I have to put in the requisite work, in order to be physically capable of implementing my coaches plan. My subtitle is a paraphrase from Remember the Titans, where a coach asks a player if he believes football is fun. If you follow any of the top players in our league on Instagram, you’ll see them in the gym. Is the gym fun, or is it a pathway to enjoying the sport? A friend of mine who I won’t name drop, spent at least 8 months (if not longer) rehabilitating a torn ACL following surgery with the sole aim of making it back to the field. I would never ask him if it was fun, but I know he did it because he enjoys the game. He wanted to win, he worked, did everything within his power to get stronger, fitter. Is learning my playbook fun? Is my gym session fun? Is running the fifth, sixth, seventh Kick off drill fun? For me, none of those are fun. But what I enjoy, is when the playcall comes I know exactly what I’m doing, I enjoy being fit enough to be on special teams in the third quarter, I enjoy having the strength to beat the man in front of me. When people ask what is there that needs to be done to improve the British game here’s a simple answer. We have to take the fun out of the game for the majority of our leagues. That’s not to say there isn’t a place for the players who want to have fun, but we need to realise the distinction between those who play for fun and those who play for the passion of the sport. The difference between the coach who spends all hours to watch film, devise game plans, research their drills, and the enjoyment they derive from seeing their players winning. We have to distinguish, that fun can never be a goal for many of the people in our league. Playing for fun is the difference between putting the second string in when the clock is running and leaving the first string in to run the plays a coach wants until he’s happy, even if that sees the score being run up. I’m going to end with a quote from the Silas Nacita documentary that I think sums up amateur football in Europe. When we find ourselves in this situation, we must come to terms, that we aren’t playing this sport for fun anymore. We put our bodies on the line for the purest form of this sport, with most having no hope of ever seeing a penny from the play. Recognising we’ve stopped playing for fun, and bringing our game up together will continue to be the best way of moving our sport forward. Play for your passion, play for pride, play for the brothers to your left and right on the field. Fun just isn’t part of that equation.